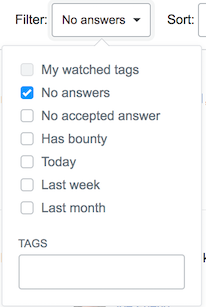 On the questions tab can we have a filter feature(I mean like frequented votes etc) of watched tags. I am aware that the tags that I have watched are demarked in a different colour. But I would like to discuss the pros and cons of getting a dedicated watched tags filter because I feel most people are well versed in certain specific areas of mathematics and would like to answer questions on that domain. This may not be so useful for asking questions as exploring newer areas of mathematics is generally encouraged upon. On the other hand its good for everybody that they answer questions on domains that they have command over. Any suggestions in this regard are welcome. The search query intags:mine returns only posts in your favorite tags. If you sort by activity and perhaps add is:q it should look similar to the list of questions in various tabs on the main iste. Stack Exchange is currently developing "Custom Question Lists". The feature is currently alpha-tested on Stack Overflow, Meta Stack Overflow, and Meta Stack Exchange, but according to the timetable, it will be enabled on all sites on January 2019. Not the answer you're looking for? Browse other questions tagged discussion feature-request favorites . Is it possible to have conjunction of certain “favorite tags”?